Sutton bed and breakfast travel guide for romantic, historic and adventure b&b's. 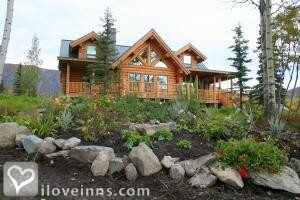 Browse through the iLoveInns.com database of Sutton, Alaska bed and breakfasts and country inns to find detailed listings that include room rates, special deals and area activities. You can click on the 'check rates and availability' button to contact the innkeeper. Sutton, Alaska was once known as Glacier View. The Matanuska Glacier and River are two of the must-see spots and to take a tour of this area, join Glacier View Adventures. For the more physically active and daring, Sutton also offers glacier trekking and ice climbing. See the area by taking a chartered flight tour with Meekin's Air Service or Blue Ice Aviation. Arrangements for these can be made while at Sutton bed and breakfast inns. Hikers, can try the trails at Chugach and Talkeetna Mountain Ranges. Other attractions in Sutton to see include St. Elias National Park and Glenn Highway Scenic Byway. By Matanuska Lodge.